An early morning run took me onto a rough trail into the San Bernardino Mountains, away from urban chatter. Snow and ice made the run treacherous, and my focus was on my footing. When the trail flattened out, and the snow melted into decomposed granite and sand, I stopped to catch my breath. And that’s when I finally heard — nothing. For those of us who live in cities, silence is rare. Prolonged silence is deliberate, necessary — a relief. I stood for a long time, listening to late fall unfolding around me. The longer I stood, the more the forest began to recover from my activity. Mountain chickadees began to drop down from the black oaks, their wings thrumming — one, two — hopping nearer, their necks craning up with each hop, looking for movement high and low, then bending into the leaves to dig around for food. Then three, four, five, twelve, twenty chickadees moving within my sight. A scrub jay swooped in, croaking. An acorn woodpecker soared overhead, his black and white wings distinct against the blue. A moment later, heard his sharp knock, knock, knocking on a pine. Then the tinier tap-tap of a chickadee trying to break something open on a twig nearby. The longer I stood, the more the silence came to life. The less I stumbled and bumbled my way over the ice, the more still I became, the more the forest had to say. It was just a small moment. I felt lucky to listen in. When my grandmother died in the 1960s, my mother cleaned out her house and brought home crates of her own childhood books. Two of my favorites were Maida’s Little Shop and Maida’s Little House. I read them over and over, immersing myself into a world where people treated each other with kindness and respect, and old-fashioned, hands-on pursuits were valued. Recently, I read both books to my daughter. In Maida’s Little House, I was struck by how connected the characters are to nature. Maida, the once-frail daughter of a wealthy financier in the early 1900s, invites her robust friends to join her in housekeeping for the summer in a little house somewhere in New England. The grounds of the little house include a lake, woods, and access to the beach. The children are amazingly independent, and work hard in the vegetable garden and taking care of their house, childcare and cooking, but also spend significant hours lounging and talking, eating popcorn before a fire, swimming in the lake, canoeing and growing strong through contact with nature. The children know the names of every flower that grows in the garden, every tree in the woods, every fish in the lake. The children track down dear and watch them quietly, explore caves, wander off alone for picnics across the lake. It’s a beautiful world I enjoyed visiting again. And it reminded me why I became an environmental educator — to experience that connection in my own life. 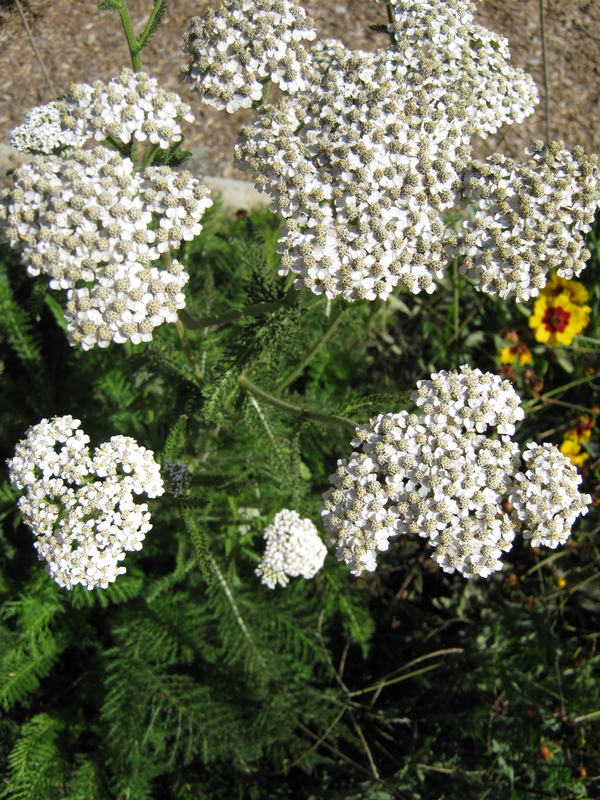 The photo is of a garden flower I know and love — white yarrow. For the last five years, I have been blogging about school gardens in the blog I create for the school garden where I worked. I am now teaching science at a new school, and gardening and exploring nature with my students and my own children. I’ve turned my old blog — explorergarden.wordpress.com — over to a new owner who will maintain it, and the wonderful garden that goes with it, for the school. I am now free to blog on my own, about my own experiences in nature as a writer, environmental educator, and nature lover. I plan to blog weekly — or as often as something in nature taps me on the shoulder and says, Wow, take a look at this!